The first general-interest study of the global spread of alien, "exotic" organisms and how they are undermining the world's ecosystems and societies. Worldwatch Institute researcher Chris Bright explains why conservation biologists are raising the alarm about a global threat to biodiversity that is unfolding largely unnoticed — bioinvasion, the spread of alien, "exotic" organisms. With the exception of a few spectacular invasions, like the zebra mussel's conquest of the Great Lakes, there has been little public recognition of the dangers posed by these invading species. But exotic species are injuring our biological wealth on virtually every level — from the genetic (when exotics interbreed with native species) to the wholesale transformation of landscapes. 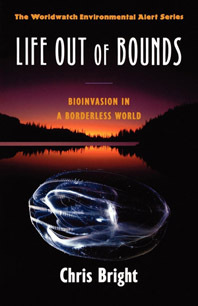 Life Out of Bounds shows that this "biological pollution" is now beginning to corrode the world's economies as well. But the policy responses, on both the national and international levels, have usually been weak and uncoordinated. This book outlines the current scientific research on the threat, the social and economic implications if these invasions are allowed to continue unchecked, and steps that can be taken to contain the spread of exotic species.